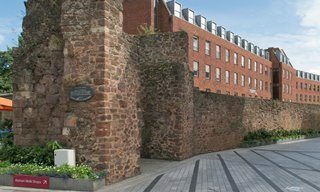 Exeter now stands on the site of what was a Roman legionary fortress, established in 55 AD by the second Augustan Legion. The fort, known as Isca, then overlooked the lowest crossing point of the Exe River. By the middle of the second century Isca Dumnoniorum, the town that grew up in and around the fortress after the departure of the legion, became an important regional centre. A substantial wall with four gates was constructed; the path of which can still be followed in the city today. With the collapse of the Roman administration in Britain, the town was all but deserted and returned to farmland. 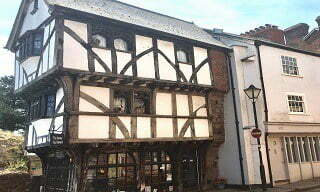 It was not until the late Saxon period that town-life was re-established, and Exeter became very prosperous. The quay on the Exe River, also established by the Romans, enabled the city to develop trading links making this one of the wealthiest ports in the south of England. 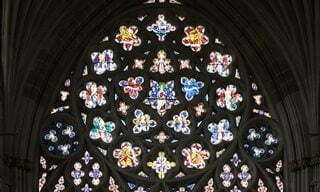 During the Second World War, Exeter was extensively bombed by the German Luftwaffe. In all, between 1940 and 1942 a total of 18 raids destroyed much of the city and 156 people lost their lives. And more recently a fire that broke out on 28 October 2016 largely destroyed the Royal Clarence Hotel, thought to be the first venue in England to call itself a hotel. 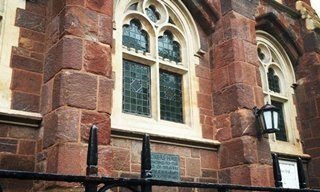 Despite the ravages of the 20th and 21st centuries, Exeter has much to offer those who enjoying exploring the past: from the oldest standing castle building in Britain, a unique system of underground passages, and one of the oldest cathedrals in England, which has the longest stretch of Gothic vaulting in the world. 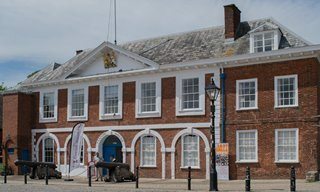 And a world class museum that offers an engaging introduction to the city and Devon. 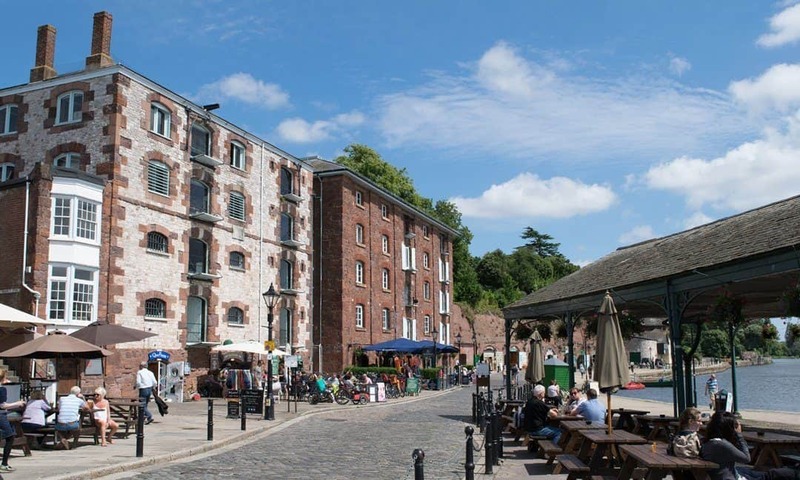 Exeter’s historic quayside, one of many interesting and beautiful places in the city to stop for a bite to eat or an ice cream on a sunny afternoon. 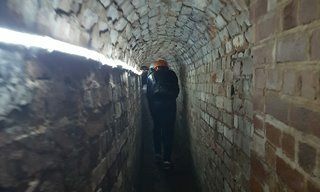 Located in the Bartholomew Cemetery, the catacombs were built between 1835 and 1837 up against the city walls. 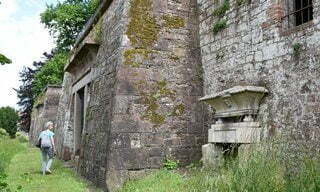 The cemetery was the first in Britain to be constructed using public funds. 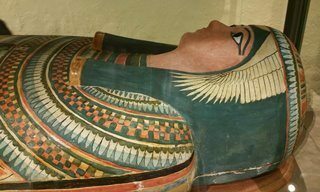 Also, the use of Egyptian style architecture for the entrances is the first instance of Egyptian revivalism in a British cemetery. As a venture, the catacombs were a failure as it was too costly for most. When the cemetery closed in 1946 only 11 people had been interred. Watermills have stood on this spot since 1220 AD. Over the years there have been nine mills in all, including a grist mill for milling grain and a fulling mill for cleaning and strengthening woollen cloth. 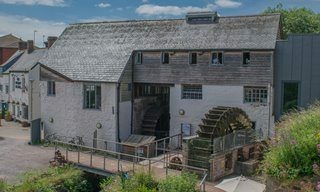 The surviving mill house was restored in the 1990s by the Devon Historic Buildings Trust, with a hydro-turbine installed in 2010. Electricity produced by the mill powers the visitor centre, which is at the centre of a wildlife garden run by Devon Wildlife Trust.